A milled titanium bar or cast gold bar is made into a framework to fit a number of implants. Titanium milled bars are lighter, better fitting and cost less than gold bars to fabricate. Denture teeth are processed onto the bar using denture acrylic. Access holes for screws, pass through the chewing surfaces of the denture teeth. The entire framework down onto the implants fixtures. The access holes are later filled in with tooth coloured filling material and can barely be seen. The appliance cannot be removed by the patient and can only be removed by the dentist if required. Hybrid dentures rest on implants and do not rest on the gums. 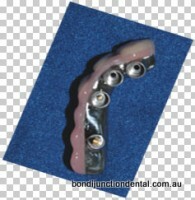 Implant hybrid dentures can not be removed by patients but can be removed by the dentist for maintenance if required. 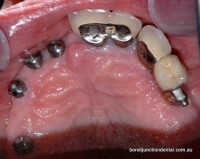 Are much less expensive than crowns on individual implants. Need to clean under the bar. Denture teeth may require maintenance over time but are easily replaced.